November 2014 marks the 95th anniversary of MacGregor's Hatlapa brand. Since its foundation in 1919 by German engineer Max Hatlapa, the formerly independent Uetersen-based company has strived for engineering excellence. Last year, in recognition of these qualities and the benefits that Hatlapa offers, MacGregor purchased the company to complement its offering to the merchant shipping and offshore customers. "Over the years, Hatlapa has won a worldwide reputation for quality German-engineered products," says Alexander Nürnberg, who was previously Managing Partner of Hatlapa Uetersener Maschinenfabrik GmbH & Co. KG and today heads the new Auxiliary and Machinery Systems Division at MacGregor. "From its outset, Hatlapa has adapted to market demands." With an initial product offering of high-quality small diesel locomotives, mobile electric generators, and diesel-driven cargo winches, Hatlapa soon established itself as a technological forerunner in the shipping industry. It also started to expand its product portfolio from merchant shipping to offshore specific products. 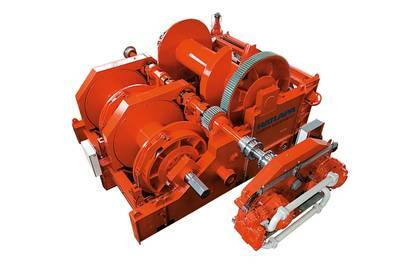 Hatlapa branded winches, compressors and steering gear are sold worldwide. The portfolio includes anchoring, mooring and cargo handling equipment with electric variable frequency drives (VFD), and low-pressure hydraulic and high-pressure hydraulic drives. This combination of technology can provide the ideal solution for a number of applications and in particular the requirements of the global anchor handling market; a significant area of focus for MacGregor. This expanded product range is already reaping rewards and was instrumental in securing a recent contract with the Wuhu Xinlian shipyard in China to supply deck equipment for two 150-tonne bollard bull anchor handling tug supply (AHTS) /oil recovery vessels. The MacGregor equipment packages for each vessel will include a medium-pressure anchor windlass/mooring winch, capstans, tugger winches, storage reels and a power pack. From MacGregor's Hatlapa range each vessel will receive a 300-tonne line pull/450-tonne brake holding capacity low-pressure anchor-handling/towing winch, equipped with quick-release friction clutches. From its Triplex range, MacGregor will deliver 360-tonne SWL shark jaws and 200-tonne SWL guide pins. MacGregor is scheduled to deliver the equipment by May 2015. There is an option for two more shipsets. "This is one of a number of new orders that our combined capabilities have proved beneficial," notes Mr Nürnberg. "The future is positive. As part of MacGregor, Hatlapa will continue to be recognised as one of the most respected brands in the shipbuilding industry."